RANTWICK - Commuter Cycling in London Ontario | A Bike Blog: I Am Very Very Sorry. Please Don't Hate Me. 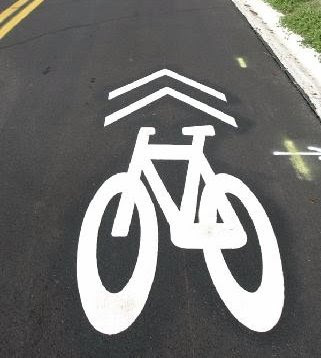 Ever since I first heard of "sharrows", I've had this stupid image knocking around in my head, like an earworm. I guess this is an "image worm", or perhaps a "mind's eyeworm". Anyway, it's been bothering me for some time, and I need to get it out, and I think posting it here might be the only way. I am very very sorry. Please don't hate me. Um... I too have recurrent Word to Form disease, or W.T.F. It often manifests itself just after the ambien hits, and before the drooling starts. There is help out there. The Word to Form Association for the Safety of Sight (W.T.F.A.S.S.) may have meetings in your area. Remember, the first rule of having W.T.F. is dont talk about it....Oh crap. I gotta go. Anonymous is a poser. There is help out there, and it's not in some dark back alley, at a dimly lit meeting run by some old fart with the heroine sniffles. Try Google to find out about W.T.F., or G.T.F.O.W.T.F. 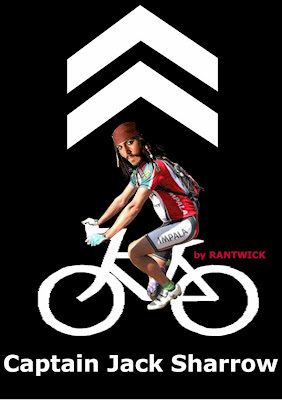 And by the way, Jack Sparrow rides a freakin Huffy. Dig the video, I am not fully qualified to answer your video quiz about stopping behind the SUV or cranking right pull-volting through traffic. That was awesome video. I could never ride like that due to lack vision but I would have bolted right! Also thanks to Cafiend for the tips on training wheels. Everything worked out great, some frustration, however, end result: The training wheels are gone. Welcome back, DogFart! Good to know I haven't lost one of my two regular readers... I'm hoping cafiend is still prowling about, and I'm guessing he'll be pleased to have been of assistance on the training-wheel removal and good results. i would have passed the line of cars, but then again, i live in Taiwan where 2-wheeled vehicles passing 4-wheels is fully supported, with large square areas (at the stoplights) for them to occupy, in front of the 4-wheelers. i just don't get the issues that American drivers have with being passed by a bike. So far, that's Thailand and Taiwan for international comments on my queue jump video... I had no idea I would be reaching cyclists on the other side of the world with this stuff; the Internet is everywhere, and I find that super-cool.